For shooting clays or paper targets, birdshot is the shotgun shell load of choice. 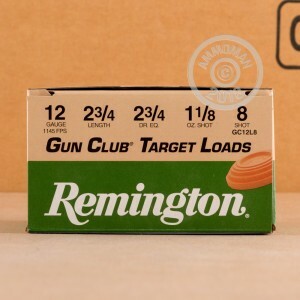 This case of 250 shells from Remington is an inexpensive, soft-shooting sporting product ideal for the range. The 12 gauge, 2-3/4" shells fire #8 lead shot measuring about 2.3mm in diameter. The one-piece wad helps them produce good patterns that reward the shooter's skills with good results. Birdshot, as the name suggests, is for shooting birds. Not criminals, not dangerous animals, but birds--clay or feathered. 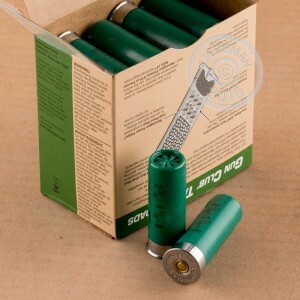 If you're looking for a home defense shotgun shell, it would be a good idea to consider smaller buckshot loads. Buy enough ammunition to reach a total of $99 or more and you'll save double digits with AmmoMan.com's free shipping. That's right, you pay only list price for any order larger than $99.